School going students make prototype of rocket while participating an workshop in Dhaka recently. 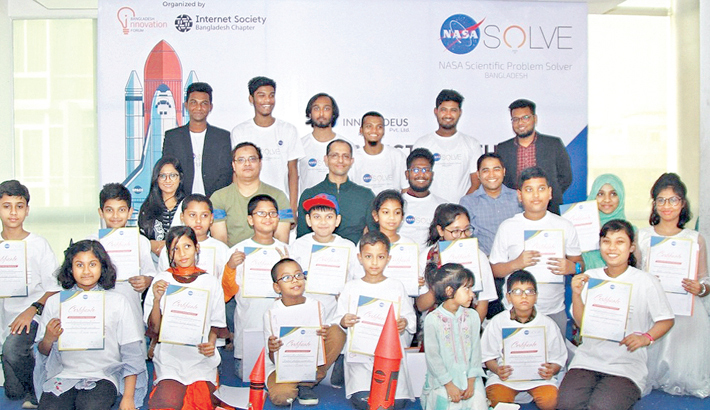 NASA Scientific Problem Solver Bangladesh, Internet Society Bangladesh chapter and Bangladesh Innovation Forum jointly organised the maiden initiative to introduce rocket science to school goers. Some 30 students received orientations on developing rocket at the daylong workshop at Krishibid Institute in the capital. Bangladesh University of Engineering and Technology (BUET) Computer Science Engineering Prof Shahidhur Rahman was the chief guest while BIF founder Ariful Hasan Opu presided over the meeting. Among others, ISOC Bangladesh General Secretary Mohammad Kawsar Uddin, aeronautical scientist Rabi Sankar Sheel, Bangladesh IP Forum Founder Hamidul Misbah and Innovedus Operations Head Nakeeb Swadhin Khan spoke on the occasion. Organiser informed that there will be sent a child-delegation to NASA at end of this year.